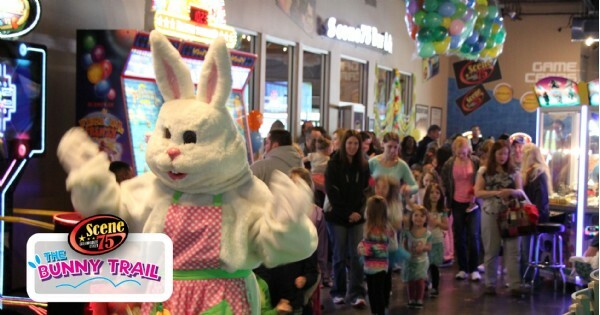 Enjoy a buffet style breakfast with your family and Scene75 Easter Bunny! The Easter Bunny is stopping by Scene75 for breakfast on Saturday, April 20th, 2019 and wants you to join! Visit Scene75 between 9-11am for a delicious breakfast buffet with the Bunny. During breakfast the Bunny will be hopping in to say hello and visit with guests! So, remember to bring your camera! Tickets to this event are $7.00 per person (children under 2 are free!) and $12 for a ticket with a $10 arcade card included for some early fun after breakfast. Save your seats and get your tickets below! Ticket purchase is required for all parents and kids who attend (aside from those 2 and under). Tickets at the door on the morning of the event will be $9 each and $15 for the bonus arcade card (this is on a first come, first serve basis!). Find more events like "Breakfast with the Bunny at Scene75"